BarnWorld.com farm and ranch supply has a complete selection of hog feeders and hog drinkers ready to ship to your location. We carry a hog feeder for every need and every size operation including indoor hog feeders, outdoor hog feeders, nursery hog feeders, polyurethane hog feeders, grower hog feeders and finishing hog feeders. We have 2 bushel up to 80 bushel hog feeders to suit your operation. BarnWorld.com also carries the MiraFount energy-free 2-lid and 4-lid hog waterers. These hog waterers are top quality and will last virtually forever. Each hog waterer comes with a heater to install in the ground underneath so your water never freezes. BarnWorld.com farm and ranch store carries the largest supply of livestock feeders on the Internet. Visit us at http://www.barnworld.com or call 720-238-2190. BarnWorld.com accepts all major credit cards, checks, money orders and wires. We ship right to your doorstep by freight. We also ship to all international locations. Call or send us an email with your zip code for a shipping quote. BarnWorld.com has both 2 lid and 4 lid automatic hog waterers and a variety of both indoor and outdoor hog feeders. Cool water in summer can relieve heat stress on hot days to keep them comfortable and retain weight. BarnWorld.com sells the MiraFount energy free hog waterer line. Each hog waterer includes a water heater to be installed underground under the unit so water never freezes in winter. The MiraFount 2 lid hog waterer holds 6 gallons of water – enough for 100 head of market hogs or 50 sows. It has 10” lift up openings with underside lid seals. Other features include a low drinking height profile for small pigs, easy access to the valves and large drain holes for easy cleaning. The MiraFount 4 lid energy free hog waterer holds 15 gallons of water – enough for 200 head of market hogs or 100 sows. BarnWorld.com farm and ranch store has all the farm and ranch supplies you are looking for. We ship worldwide. Visit us at http://www.BarnWorld.com or call 720-238-2190 for all of your hog feeding and hog watering needs. BarnWorld.com has a hog feeder and a hog waterer to suit every size operation and all your hog feeding needs. The indoor hog feeders are made from tough polyethylene – hog lot and confinement pen acids will have no effect on the feeder. The patented feed distribution system and smooth, inside will keep a steady amount of feed flowing freely and can feed high moisture grain without build-up or bridging. With the indoor hog feeder, your animals stay right over the trough to feed which sharply reduces waste. The indoor hog feeder has fence-line adapters so you can feed two pens with a single feeder. Heavy steel dividers bolt to the feeder on one side and your fencing panel on the other. These indoor hog feeders come in nursery, grower and finishing feeder sizes that take hogs up to market weight. The BarnWorld Big “O” outdoor hog feeders will not rust, rot or corrode. 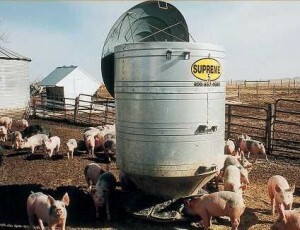 In addition, hog lot and confinement pen acids have no effect on these hog feeders. The polyethylene base will fit most sizes of feeders. The Big “O” hog feeder comes in 40 bushel, 65 bushel and 90 bushel sizes. If you are replacing an older feeder, don’t throw it away just because it has a rusted-out bottom. You can bolt the top half of your old feeder to our new Big “O” polyethylene base to save you a lot of money over buying a whole new feeder. The entire outdoor hog feeder assembly comes with a polyethylene base, trough a hopper, poly skids, painted steel supports, side feed adjustment, galvanized sidewalls, 12 feed stations, and a polyethylene cover. The supreme hog feeder offers a scalloped trough designed to save feed with 12 large openings shaped to fit a hog’s jowl anatomy. The large head clearance allows a hog to adopt a comfortable stance and eat inside the feeder. The high trough slope eliminates areas where feed would otherwise pack and spoil and returns any dragged feed back into the feeding zone. This durable hog feeder has the largest feed-saver flange on the market as well as the strongest plastic door on the market. Polyethylene skid runners never rust. BarnWorld.com sells a wide variety of farm supplies, ranch supplies, and equestrian supplies made by American manufacturers.